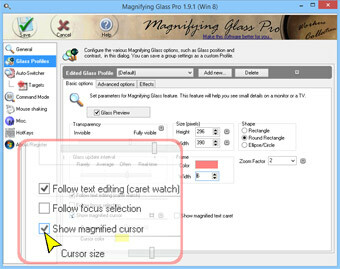 The Magnifying Glass Pro utility is a virtual magnifier (virtual lens, screen-zoomer, desktop magnifying glass) that enables you to enlarge (magnify) text and graphics as they are displayed on your computer monitor or attached television screen, or projected onto a larger media during a presentation (e.g., using an application such as PowerPoint). As you pass your mouse cursor over a section of the viewing area, the display is magnified making it instantly more readable and accessible. In addition, you can apply a variety of visual effects and enhancements to that display. Lessen eyestrain for those with normal vision. Enhance onscreen and projected detail. Allow modification of the magnified area in real time (e.g., invert or rotate the image, change the contrast). Take advantage of multi-monitor systems. For example, one monitor (or TV screen) could be dedicated to a full-screen Glass -- a magnified, easy-to-view display of the image on the primary working display. Provide you with more control over your business presentations. You need only use your imagination to come up with many more useful applications for this zoom-utility! Take a Quick Tour on the magnifier functions. Read about unique features of our PC desktop magnifying glass. On-line documentation can be viewed here. Also you may download documentation in PDF file here. Magnifying Glass Pro Languages: English, German, Dutch, Portugues, French, Spanish, Russian. Platforms: Windows NT / 2000 / XP, Windows Vista, Windows 7, Windows 8.